JEE Main Result 2018: JEE Main 2018 results are released and are now available on CBSE official website. CBSE released JEE Main Result 2018 at 6 PM on jeemain.nic.in. The Central Board of Secondary Education announced the results at the official websites. CBSE published the rank list of JEE candidates on the same website. JEE Main results for both Paper I and Paper II, students' ranks as well as the list of 220,00 candidates eligible for the JEE Advanced Examination are available on the CBSE Website. Students who attended the JEE Main 2018 Examination online and offline can check their results on the official website: jeemain.nic.in and cbseresults.nic.in. 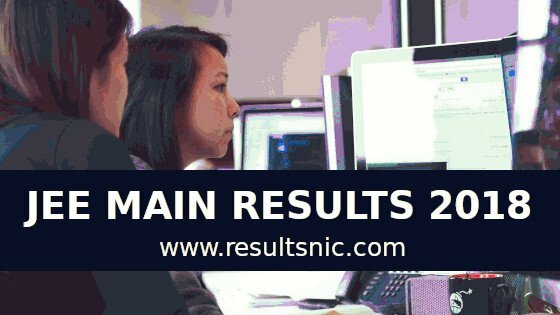 The official declaration of results is available on results.nic.in. 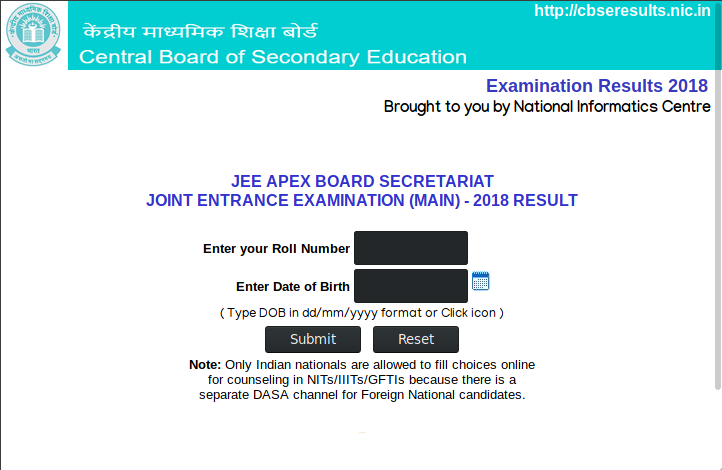 Click on the JEE Main 2018 results link on the home page (JEE Main Results 2018). Enter candidate name, roll number and date of birth on the result screen. Press Submit button to get the results and rank list. More than 14 lakh students appeared for the JEE Main 2018 to pursue higher education in various technical courses. JEE Examinations are conducted every year for admission into the architecture and engineering courses in NITs, IITs across India and this examination is the gateway examination for JEE Advanced as well. Students who clear JEE Main are eligible to take part in JEE Advanced, which is used for admission to Indian Institutes of Technology IITs and other top engineering institutes in India. The All-India rankings in JEE Main is used for admission to National Institutes of Technology (NITs), Centrally Funded Technical Institutes (CFTIs, Self-Financed Institutes (SFIs) and other institutes. JEE Advanced 2018 Application will start from 2 May onwards. The admission process which will be through Joint Seat Allocation Authority (JoSAA) will start tentatively from 19 June after the results for JEE Advanced are announced. Candidates who qualify for these exams will be eligible provided they also have secured a minimum of 75 percent in their 10+ 2 or are in the top 20 percentile of their respective boards. JEE Main is the entrance test for admissions to 23 Indian Institute of Information Technology (IIITs), 31 National Institute of Technology (NITs) and 20 Government Funded Technical Institutes (Other GFTIs). The offline exam (JEE Main) was conducted on 8 April and the online exam was held on 15 and 16 April. The answer key for JEE Main 2018 was released on 24 April by the CBSE. There will be no weightage for marks obtained in Class XII board exams. Candidates who clear the exam are required to secure at least 75 percent marks in Class 12 (regular/improvement) Board Exam to be eligible for admission in IITs, NITs andCFTIs.